September is always a busy month for us. Both the kids were born on this month. It’s also the month Sandy and I were married. This morning, we woke up to a new tweenager. Jennifer is now twelve. Although a year younger than Joey, Jennifer is actually a little more mature in many ways. We went downstairs to celebrate the momentous day with her. Sandy and I both enjoyed watching her open her birthday gifts. As was her choice, this meant mostly Harry Potter apparel, and Hufflepuff specifically. 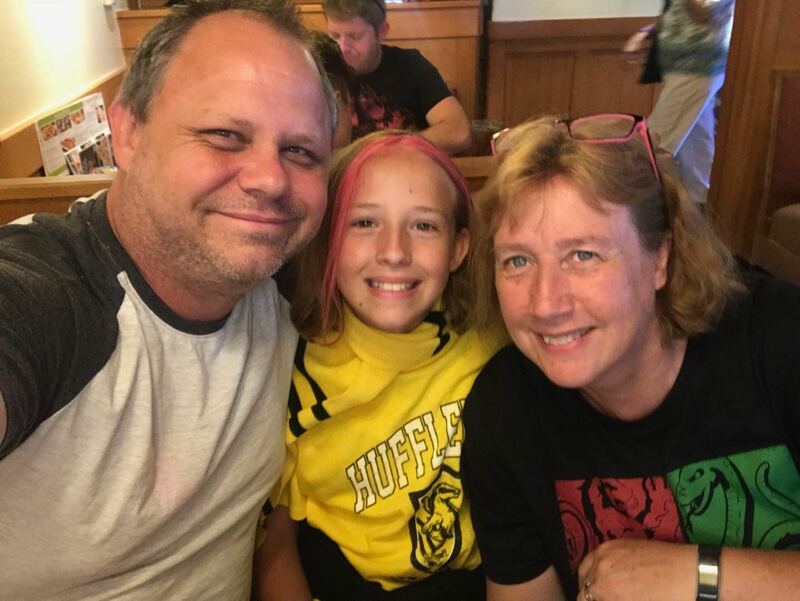 Jennifer is a big fan of the Harry Potter universe and insists she is a true Hufflepuff through and through. With no theme parks on the agenda today, we took our time this morning and had a lazy breakfast at home. We bowed to all of Jennifer’s wants today, which meant Sandy taking her over to the communal pool area. Alas, there were hardly any other people there, so Jennifer wasn’t really able to interact with any other kids, which was her main intention of going to the pool in the first place. 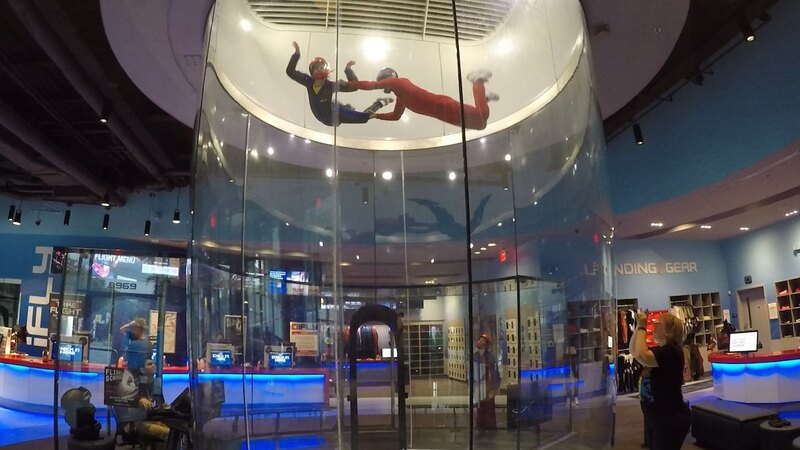 Something that Jennifer really likes is the iFLY wind tunnel flying, so we decided to make this part of Jennifer’s day. I already bought a return flight for the whole family the last time we were there, which itself was a return flight booking from the first time we were there. As it was Jennifer’s birthday, both Sandy and I decided to forego our own flights, so Jennifer and Joey could enjoy more time of their own. It would mean five flights each of sixty seconds duration for each child, which they were both more than happy with. I called them to make the booking. We booked ourselves in for the 4:45pm time slot. While making the booking, I checked whether the voucher was good for use overseas, which the flight instructor suggested was the case the last time we flew. 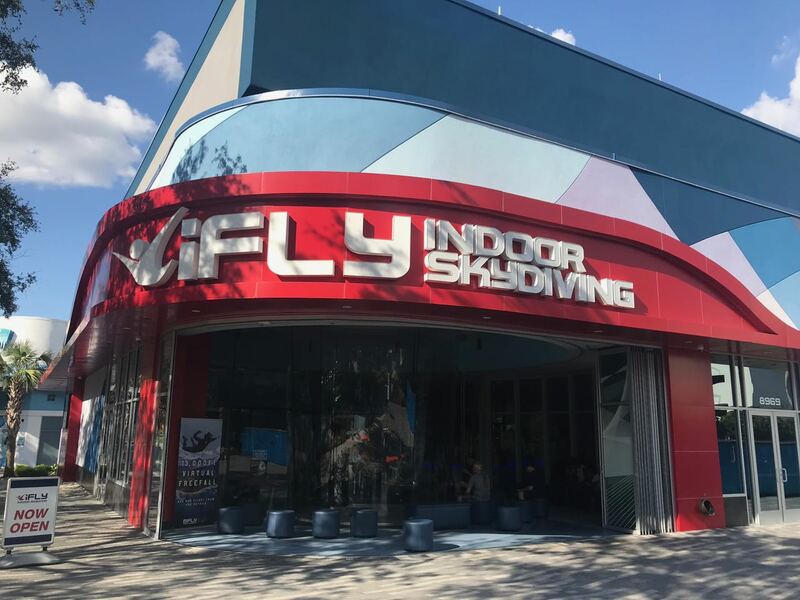 There’s an iFLY wind tunnel in Basingstoke, England, which is one of the places we will be visiting when we’re there in a few weeks. My sister, Annie, and her extended family all live in Basingstoke. We actually contemplated holding onto our return flight voucher, so we could use it in Basingstoke instead. It’s a good job I asked about this as it turns out the voucher was NOT valid for use outside of the States after all. Had we not used it here and taken it with us to England, we would have been out of luck, turning up with little more than a hole in my wallet. With the iFLY booking now secure, Sandy and I took Jennifer for lunch at her choice of restaurant. In the event, that turned out to be the Olive Garden, an Italian restaurant. Since neither Sandy nor I eat cheese, and I don’t eat pasta, there was little chance we would find something on the Italian restaurant menu to our liking but that didn’t matter. So long as Jennifer got spoiled and had her choice, that’s all that mattered. Once we arrived and were seated with a menu each, Sandy did find something in the end but there really wasn’t anything for me. That said, I did enjoy the garlic breadsticks that came with Sandy’s soup. Jennifer really enjoyed the special attention from us both throughout the course of the day. It was a joy to see this in her eyes and her bubbly personality. As it was Jennifer’s birthday, the waiter offered her a choice of any of the desserts from the menu free of charge, which was a nice touch also. Back at the house after Jennifer’s birthday lunch, Sandy did her best to have a lie down and a rest. I say try, as she never really managed to get any peace and quiet in the end. Naturally, this was my fault. Of course, there wasn’t anything I did or didn’t do to deserve Sandy’s ire. It’s just my lot in life. I’ve become used to it. Eventually, the day wore on and our scheduled flight time was rapidly approaching. We all piled into the car and set off down I-4 towards I-Drive. Our iFLY instructor today was a different one to the previous two visits. We had no complaints with him at all. He handled Joey very well. That was fortunate as Joey wasn’t especially cooperative today. For whatever reason, we were quite a bit late getting our time in the tunnel. That was the first trigger. We were with a small group of other flyers, which Joey took exception to. That was the second trigger. He has been developing an aversion to being close to strangers and was adamant he wasn’t going to participate. For a moment, it looked like it was going to be a washout, but the instructor came up with the idea of splitting us into two groups and taking us in separately. That solved the problem, but Joey was still struggling. He wasn’t happy about the helmet chinstrap, for example. That was the third trigger. It took a fair bit of cajoling by both the instructor and us to get through the session. With the exclusive attention of the instructor, both Joey and Jennifer had their five one-minute flights. Jennifer was given a free high flight, where they ramp up the air speed and the instructor helps to take you right up high into the wind tunnel a few times (you normally have to pay an extra $10 but the instructor gave this to Jennifer for free as it was her birthday). With Sandy and me not participating today, this gave us the freedom to put our phones and the GoPro to good use. Both of us got some excellent footage of both kids enjoying themselves in the tunnel. Jennifer is a complete natural. Even the instructor said so. She was able to shift herself back and forth, left and right, up and down pretty much on command. Take it from me, that’s much harder than it sounds. Flying in the wind tunnel is as much a mental thing as it is a physical one. Jennifer just ‘got it’ right from the get-go. At the end of our session, both kids were issued with their certificates. It took a little while for Joey to climb down from the experience, but he did eventually. By the time we were heading out, he was bouncing off the walls again. With both kids grinning from ear to ear, we drove over to the nearby Chili’s on I-Drive for dinner. Alas, there was no free dessert this time, despite the waiter knowing it was Jennifer’s birthday. He did try to initiate a happy birthday song for us at the table, but it was a half-hearted attempt at best. As a final treat for the kids, we stopped off at the mega MacDonald’s just up the road. Both kids were given some extra money to add to their play cards and both of them came away with a few more small bits and pieces from the prize cabinet after about a half hour. Back home, everyone was quickly to bed and the usually shutdown routine of tending to the digital lifestyle kicked in to auto-pilot once more. All in all, it was a good day today.